Our tour guide was absolutely amazing! Bus driver was such an ameaome driver despite some crazy drivers on the toad yesterday!! Deb shared her vast knowledge w/all of us on board and was so kind! I hope our tour on Friday is with the same two ladies!!!! I just can’t even fathom how Deb recalls all the dates and info she passed along to us! How lucky for your tour company to have such a knowledgeable individual working for them!!! I've taken day trips with via Viator before when I've been abroad which have been great, and had never really thought about doing it at home in the UK, but with a bunch of annual leave to use up I thought I would to visit places I wouldn't normally go. This was a really well organised trip. I did go mid-week outside of school holidays, which I think helped as both Leeds Castle and Canterbury would probably have been heaving in the holidays and at weekends, but in my case they were really quiet. Not the tour company's fault at all, but there is some major restoration work on Canterbury cathedral at present (which I was actually already aware of), so large parts of the exterior are covered in scaffolding). The attractions were great. I would have liked more time to explore Canterbury itself, so it's worth Evan Evans considering adding an extra half an hour onto the tour (I don't think you'd want to deduct time elsewhere). I did some extra exploring opting to go for lunch on the go, as it was. The company the tour was with was called Evan Evans. A few minor frustrations included communication at Victoria coach station as to where and when the bus would be departing. I speak fluent English and am used to travelling from the coach station, but if I was a tourist, I would have been confused. The coach was advertised as having wifi but didn't. Whilst I don't think this was essential at all to my enjoyment, if something is advertised it should be there. The biggest bug-bearer was there being no toilet on the coach, which is a real problem, especially as there was lots of driving through London and the M20 is notorious for hold ups. I have given this four stars however, because the trip itself was excellent, and as for the tour guide Chrissy, all I can say is WOW!!! I've been on tours before where the drive to the first attraction is where I sit back and listen to my music, because it's a case of nothingness, but Chrissy was full of fascinating information about London and it's history (which is the main reason why we drove through London). I've lived in London most of my life, but kept hearing things which were new to me. She also mentioned things which were relevant to where we were going, such as the Chaucer Tales. Motorways can be dull, but again she was able to point out relevant places of interest along the way. She was absolutely brilliant. I'm booked on to another trip with Evan Evans so I really I hope I get her again!! Good guide and safe driver. The guide provided good historical background information and tips around London as well. The only regret is not having time to actually visit Dover Castle. We enjoyed our tour very much. Our guide Chrissy was fluent in English as well as Japanese and blended the tour impressively. Our driver Barry was skilled weaves in and out of heavily trafficked London’s narrow streets with finesse. Both Leeds Castle and Canterbury warranted a full day, a strict schedule kept us focused on the main attraction at each stop. Lunch was not included but there seems to be a relationship with a local restaurant because we were given the option to order from a set menu on the bus and the food (fish and chips) was ready upon arrival, which was nice. We would recommend this tour to others. Chrissy was very knowledgeable and share this knowledge in a very positive, exciting manner. The mention that this goes through Canterbury should be clarified to clearly state that it is just a drive by. Such a wonderful experience! I was traveling with my parents who can’t speak English. But we were all deeply impressed by our guide, a elegant, friendly and professional lady! Our tour number was 22, it’s a pity that I didn’t remember her name. I wanted to say thanks to her for remembering getting Chinese instruction for my parents. They didn’t understand what she was saying. But they knew she’s so kind! Highly recommended! Generally speaking the trip is good. The Canterbury Cathedral, which is a UNESCO world heritage site, is very gorgeous and surprisingly you can find some modern decoration inside. The guide Andy Jackson is very knowledgeable. However, the cathedral tour is not a guided one as stated in the description found in Viator web site. Enjoyed the tour. Guide OK, though could have done more guiding on way back. No music on bus. Loved the music provided by Thunderbush tours in Edinburgh, but none available on this Canterbury tour. The tour was well organized with knowable lady instructor. 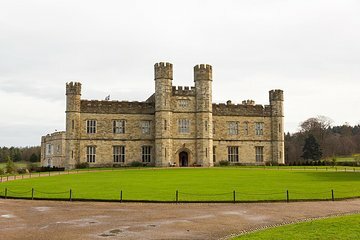 The Leeds castle was wonderful and same time we visit there were a flower show which was amazing and the flowers arrangement all over the castle.The only problem was that the tour began at the victoria couch station which is far from the tube station and we needed to walk a lot. Don't eat lunch at where they suggest in Canterbury! The food was absolutely horrible! Otherwise this was an excellent tour! Leeds Castle is amazing!!!!!! The bus is comfortable but no bathroom on board!